Tristone Blades – High Performance Handcrafted Blades by Chadd Smith. High Performance Handcrafted Blades by Chadd Smith. Chad at Tristone Blades creates high performance, hand crafted blades for the enthusiast and professional user. Each blade is meticulously crafted by hand from an idea into reality whilst meeting exacting specifications. His passion for the age old craft is forged into every blade with such conviction that simply handling one engages the user in its history. 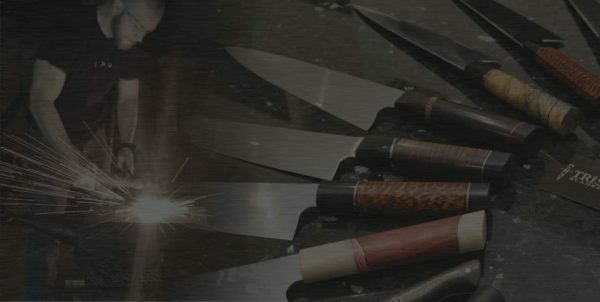 Chad is a leader in the Australian custom knife industry and has experienced a sharp rise in popularity through advanced knowledge of blade steel heat treatment, functionality and design. As an awarded knife maker and member of the Australian Knifemakers Guild and Knife Art Association, he has represented the Australian custom knife makers community on national radio to expand domestic knowledge of the custom knife industry within Australia. Each blade’s story begins at his home studio and workshop, which is frequently inspected by the site managers (his dogs). All three of them are kept out of trouble through the loving support of his wife. For current prices, wait times, and details on how to order, fill in this form. How did you hear about Tristone Blades?